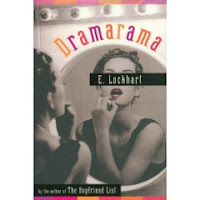 Dramarama by E. Lockhart. Reviewed from ARC. The Plot: Sadye and her best friend, Demi, have been accepted to the summer drama camp at Wildewood Summer Institute. Sadye (well, technically Sarah, but Sadye is so much better, don't you think?) knows that this will be the best summer of her life, in part because it's getting her out of Brenton, Ohio. But things don't turn out the way Sadye had hoped. What happens when your whole life is about pursuing a dream -- and you find out that you don't have what it takes? How much worse is it when your best friend does have what it takes? This is going on my best books of 2007 list. Sadye had been Sarah, living a boring life, wanting something more, and then she met Demi during the auditions for the drama camp and they instantly click. Before, Sadye loved musicals and drama; and the week before she meets Demi, she gets a new haircut and a new wardrobe, turning herself into someone who (she thinks) is more glam, more drama, less suburban mall. And then she meets Demi and her life falls into place. Demi loves theatre, loves musicals, and is gay; his parents know, but he's not really accepted. Demi is never going to be able to be himself in his small town; and while Sadye feels like she doesn't fit in in Ohio, Demi really doesn't fit in. And so, we saved each other, if you can call it saving when it takes the form of body glitter and cast albums and singing "Hot Lunch" in the back of a public bus. And so, my life was no longer razzle-dazzle deprived but utterly fabulous -- as long as I was with Demi. Brenton, Ohio is not -- needless to say -- a place where to musical-loving drama kids fit in. At Wildewood, for the first time ever, they find a place where they fit. Except, spoiler time here, it turns out not to be so true for Sadye. It's a tough realization: she wants to be "The Star" and at best she's in the chorus. It's a hard reality* to face, made tougher as Demi shines. Demi has what it takes to live his dream; and Sadye has to deal with losing hers. Needless to say, Demi increasingly feels "at home" in Wildewood as Sadye feels increasingly the outsider. Can their friendship take this stress? This is a fascinating look at friendship; how much was Demi's friendship with Sadye based on his loneliness? A loneliness that no longer exists? What about Sadye, left behind, without even a dream? OK, obviously that's the part that really captured me. But what is great is that all this is happening while at drama camp; so for both Demi and Sadye their is the exhilarating power of freedom and independence (remember your first time away from home, whether summer camp or college), including the freedom to find yourself and be yourself. Add to it the fact that it's a golden time when the biggest worry was love, friendship and happiness? Yes, they are big worries... but it's worries taking place during that time where you don't have to worry about rent/mortgage/food/work. It's almost bliss. Also good: the mix of friendship and competition. All these students have so much in common; almost too much in common, because only one person can get a role. Also good: the powerful and pure emotions of love and jealousy. And finally, the music. If you love musicals, you'll love this book, the songs, the references, it's a pleasure and you find yourself humming and singing along. And digging out old CDs or downloading songs from iTunes. Lockhart has created an iMix list of the tunes to assist. Last note: I read this and Beige by Cecil Castellucci back to back, which led me to wonder, what if Katie/Beige had been into musicals? What would her punk father had thought of that? Edited to add: Sadye tells her story with an incredible amount of honesty about her own insecurities, fears, and jealousies which is so refreshing; she is a likeable character who admits to bad and negative feelings. Very realistic. *Can I tell you how much I loved this part of the book? Having just read Horace and Morris Join the Chorus (But What About Dolores) to Cheetah & PeterParker, where, basically, the message is if you want to be in the chorus you should be even if you cannot sing, I rejoice in a book that says yes, sometimes your talent and ability do not match your dreams, no matter how much you want it and how much you do (lessons and practice) to achieve it. Dolores shouldn't be in the chorus. This sounds like the book for me. It was hard-going for awhile to realize that, despite being in the "gifted and talented program" with so much potential, blah blah, that I was at the bottom of that barrel of gifted monkeys. I had some sort of crisis/epiphany (both!) in high school when I thought I was ready, really ready for a lead role in the school play, and instead I got a one-scene character. I agree - It's a great book. The characters feel MORE real because of their flaws and their moments of selfishness / being torn between what they want to do and what they ought to do. It's on my BB2007 list as well.